ABCya produces lots of games designed to help elementary school students sharpen their skills in a lot of areas. Included in ABCya's catalog of games is a fun typing game called Cup Stacking. In this game students have to type the letters that they see on the cups that appear on their screens. When they type the correct letters the cups stack up into a pyramid. Once the pyramid is built students have to type the letters again to deconstruct the pyramid. The object of the game is to build up and take down the pyramids as quickly as possible. The Cup Stacking game is fun, but it doesn't inherently reinforce the "home row" technique. However, ABCya's Alpha Munchies game does reinforce the "home row" concept. In Alpha Munchies students to type letters or words, depending upon their skill level, to guard their virtual lunches against "Alpha Critters" who are trying to steal their food. I played both games for a while and could see how students would get sucked into playing them for a long time. The longer they play, the better they should get at typing quickly and accurately. If you're going to have students use the games in your classroom, I recommend having them use headphones or turn off the sound as the music might drive you nuts after a while. Photos for Class is one of my favorite sites for students to use to find free images to use their projects. The most outstanding feature of Photos for Class is that it automatically adds attribution information to the footer of the images that students download. For the last few years Photos for Class has relied on Flickr's library of Creative Commons and public domain images. Recently, Photos for Class started to include public domain images from Pixabay's safe search. In the following video I demonstrate how you can use Photos for Class to find and download free images. Disclosure: Photos for Class is owned by the same company that owns Storyboard That and advertises on this blog. Update: This webinar is now available on-demand. 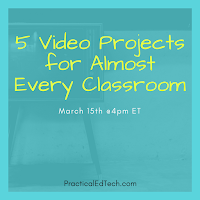 In this one hour webinar you will learn how to create and complete five video projects that can be done in almost any classroom. 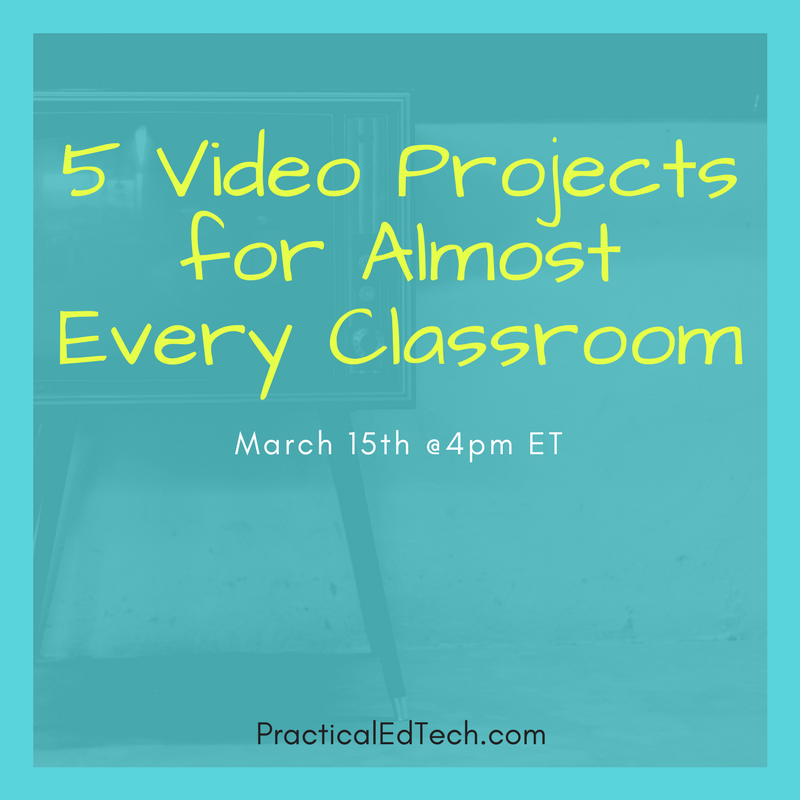 You’ll learn how your students can make five types of videos in your classroom. Examples from real students and teachers will be shared during the webinar. In addition to the how-to element of the webinar we’ll cover planning, assessment, and privacy concerns. The cost for this webinar is $20 which includes the webinar recording, handouts, and a PD certificate. Click here to access the webinar on demand. Anyone who has ever wanted to try making videos with their students. Teachers who have tried making videos before, but didn’t get the results they wanted. Anyone who is short on time and wants to get a handful of new project ideas and demonstrations. 1. How to plan a video project. A planning template is included as part of your registration. 2. How to create animated videos, documentary-style videos, and instructional videos. 3. Discover and use public domain and Creative Common licensed media. 4. How to safely share videos in K-12 environments. 5. Ideas for assessing students’ videos. Yesterday, I shared a student-produced video from Next Vista for Learning. This morning I have a good example of a teacher-produced video found on Next Vista. In the following video Brian Ellis explains what the Snap programming language is, demonstrates how it works, and explains the differences between Snap and Scratch. Take a look at the video and think about how your students might make use of Snap's features. It's that time of year again when most of us in North America have to move our clocks forward by one hour. That's right, Daylight Saving Time starts on Sunday! That means that on Monday morning you may have some students may come to class complaining about their lost hour of sleep. They may also wonder why we have Daylight Saving Time. 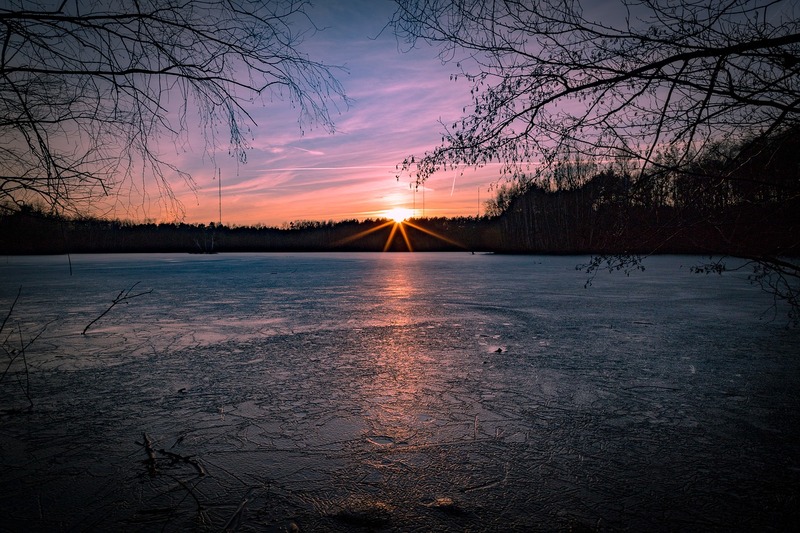 The following videos offer concise explanations of Daylight Saving Time.